Ministry of Human Resources Development (MHRD), Government of India has extended the date for submission of claims by banks up to 10th October 2015. The eligible students may contact their Branch Managers to ensure that claims have been submitted or their names have been included for submission. This is an one-time opportunity provided by MHRD to all the Banks to rectify their earlier mistakes. If the Branch Managers say that they have not received any information from their Head Office, the students can politely request them to verify with their Head Office or Zonal Office. If the students / parents do not receive proper response from the Branch Managers, they can meet the concerned Zonal Managers and submit a letter in writing to the Zonal Manager. ELTF gets frequent complaints that some Branch Managers deny interest subsidy to eligible students on the ground that the student had paid the interest, had not paid interest, or closed the loan account, etc. If the student is otherwise eligible for interest subsidy, as per the scheme, then they cannot be denied the subsidy under different assumed reasons. In such cases, the students can complain to the Chairman of the Bank and RBI immediately without any delay. Before making such complaint, the students should give opportunity to the Manager to verify with their higher officials. They can also send a written complaint to the Branch Manager, Zonal Manager and the Chairman of the Bank through Speed Post, if the Branch is not providing proper information or guidance. It is the duty of all the Branch Managers to provide the information to the students. The Branch is required to give all clarifications to the students. Please go through the following three links to get better understanding. 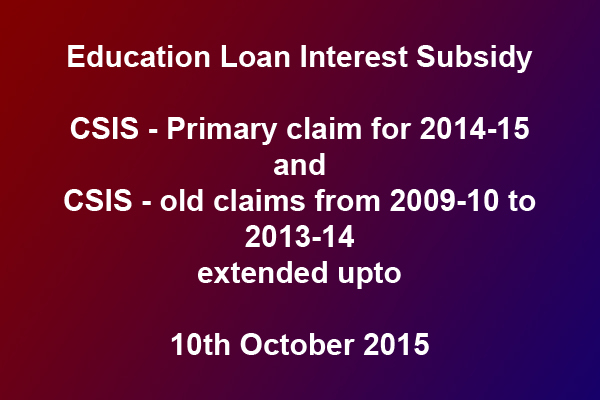 Pending interest subsidy claims from 1.4.2009 to 31.3.2014 can be submitted as one time measure. Please avoid contacting ELTF through mail or personally without going through the site and without attempting to resolve your grievance at Bank level.